Just when you thought the city of Greyport was safe, new threats appear from the sea and the sky! This expansion introduces four playable characters - Captain Whitehawk, First Mate Remy, Brynthe Boatswain and Tara the Navigator. These characters are joined by new heroes and items which will help you sqiare off against the pirate monsters and their evil boss. This product includes five scenarios, three bosses, three locations, a "cannon die" for damage rolls, and three pirate ship cards for when it's time to take the fight to the bad guys. The city needs your help again! Will you ansŵer the call? This is an expansion and not a complete game. 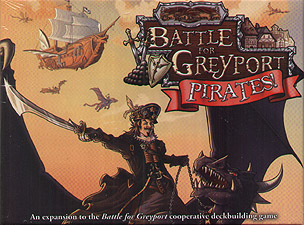 You will need a copy of the original Battle for Grey Port game to play.